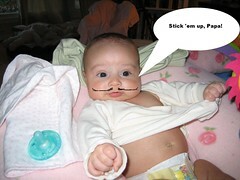 The missus is occasionally troubled by how little of her Hispanic heritage our daughter shows. Her worries were only multiplied when her nephew came over the other night. Like our daughter, he has a caucasian dad & a Hispanic mother. He claimed that when he was a toddler and would cry in public, white women would say to his mother, "don't worry, he just wants his mommy", as though she were the nanny. Fortunately, as this picture indicates, the little baby cupcake is embracing her South of the Border heritage nicely. I just stayed at the Hotel Healdsburg for a couple of nights, up in Sonoma. Interestingly enough, they didn't seem to provide in-room internet access, and just left that up to the city gov't, which had blanketed all of Healdsburg with free wi-fi. For dinner we ate at a place called Cyrus, which is supposed to be not quite as fancy as The French Laundry, but honestly, my fancyometer (a device I use to gauge the relative fanciness of people and/or places) only goes so high, and Cyrus was definitely in the upper registers. After being served things like wild boar wontons & red wine truffled rissotto, I ended up eating (on a dare) a ball of deep fried bone marrow that I can only assume was served as a practical joke. There aren't words for how horrible it was, but maybe this will illustrate the point: I read (I think in Maus) that the nazis employed a man to preside over the mass corpse burnings & scoop up the rendered white hot fat of the victims, ladling it back over the bodies to aid in the cremation process. The taste of the deep fried bone marrow ball made me immediately (as I was swallowing) imagine drinking a ladle full of rendered human fat from a cremation. mental note: never go to Versoix, Switzerland. 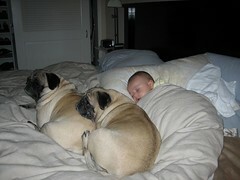 I thought my pugs were awesome, but that was back before I found out about Jesus. No, not our lord & savior, silly, the REAL Jesus, Jesus the Pug. Don't tell me you've never heard of him? He's been in a number of famous events over the years. Fantastic video of a funkified 70's version of Just, from Radiohead's The Bends. Oh, internet. I love your crazy obsessiveness. You are currently browsing the jonsonblog blog archives for March, 2006.